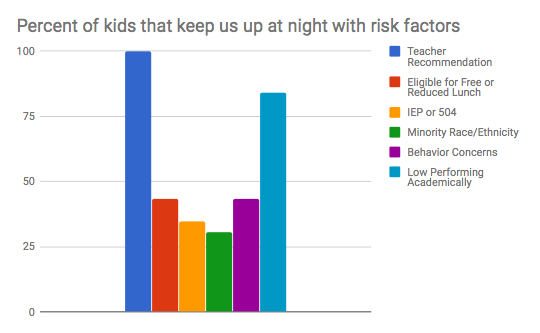 Claim 2: Palouse Prairie students identified as at risk (the students that keep us up at night) show measurable and meaningful academic growth over time. Palouse Prairie School is a small school. We have approximately 190 students K-8 and often have students who attend our school for a few years and then move on. Because of this, our sub-populations are extremely small and data for these groups is difficult to analyze, both within an academic year and across several academic years. To help us carefully examine how we are supporting our students with the most need, we have identified our own sub-population of students in our school: The kids that keep us up at night. These are the students teachers have identified as having behavior and/or academic struggles. These students may also have additional risk factors such as IEPs/504s, identifying as a minority population and/or qualifying for free and reduced lunch. To help us quantify this group of students, we went through a process as a school that began with teacher recommendations of students that “keep them up at night”. After this list was generated, we collected and aggregated data on the other risk factors listed above. 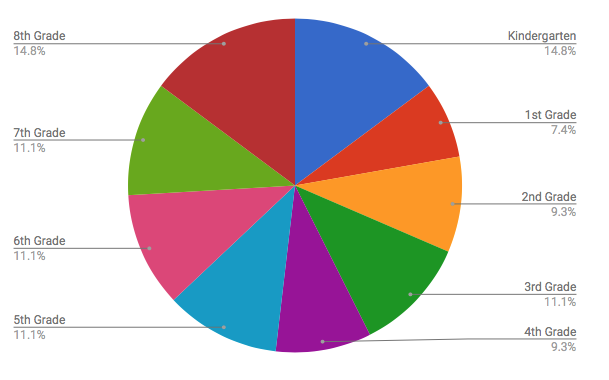 This graph shows the total of each risk factor for the group of students we identified. Please note, most students have several risk factors and each risk factor as counted as an item. Nearly 90% of these students are low performing academically. Nearly half of these students come from families with fewer financial resources. Many of these students have had behavior issues at school. To fully understand how we are serving this group of students, we developed a ranking tool that assigned a point value for each of the risk factors above. Students with raw scores of 3 or more, meaning they have 3 or more risk factors of the five listed were included in our final student list of at risk students. Our sub population group consists of 53 students, approximately 25% of our student population. This group somewhat evenly distributed across grade levels, though there are more 8th graders and Kindergarteners than students in other grades. Most of these students are low performing academically. In the 2015-2016 school year, 3rd-8th grade students in this cohort scored below their peers on standardized achievement assessments. However, students in this group outgrew their peers over time. 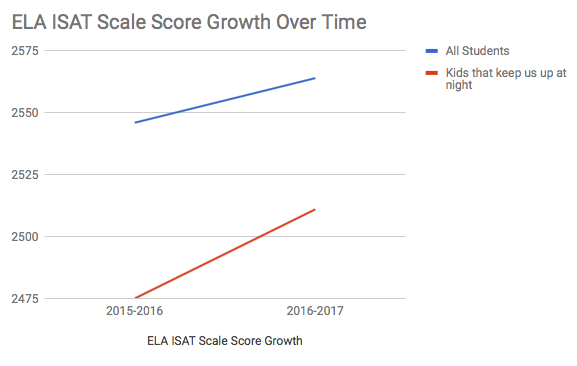 The line graphs below show the scale score growth on the ISAT (Idaho Standardized Achievement Test). The group of at risk students grew at double the average of their peers in ELA, and more than 1.5 times the average of their peers in math. Over time, we are decreasing the academic gap between at-risk students at our school and the students who are considered not at risk. This translates into better academic outcomes for this group of students. This group of students receives additional attention and both formal and informal interventions to support their learning in the classroom. EL Core Practices define differentiation as services that provide additional support, intervention, or extension. In the last year, we have specifically focused on adding additional support staff to work with our at risk students to provide supplemental support for these students. We have added a staff position to support behavior issues and preventatively work with students who are at risk, even if they are not actively exhibiting a need. Working with each child holistically and attending to their various needs has helped us to support students in making remarkable gains. These additional supports both academically and behaviorally have supported our students in growing academically at a faster rate than their peers. 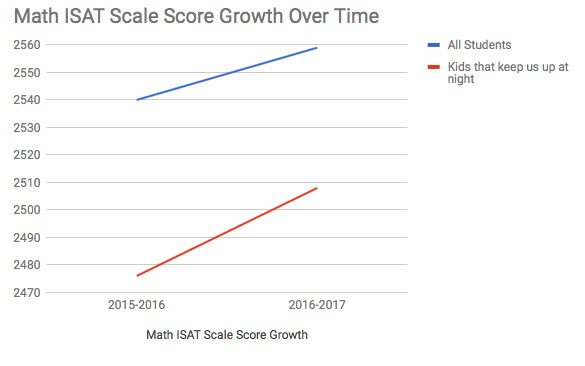 We feel confident that our kids who keep us up at night will continue to outgrow their peers; closing the academic gap that exists for many of these students. We will continue to provide additional academic, behavioral and social supports to these students and their families to ensure the best possible outcomes for all students at PPCS.